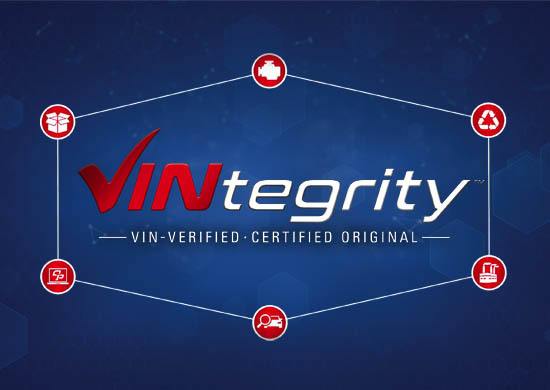 TO DELIVER A TRULY 100% CERTIFIED ORIGINAL PART™, IT TAKES VINTEGRITY™. At Original One Parts™, we set incredible standards for ourselves, and it all starts with our proprietary VINtegrity™ certification process. With our six-step, VIN-to-VIN verification, we ensure that every part is able to perform to the form, fit, function and finish of an original. Giving you the performance, savings and peace of mind you’re looking for. We work alongside industry partners to secure the most in-demand parts, whether they’re mechanical, suspension, absorption, electrical or appearance. Our nationwide network of recyclers allows us to easily access the parts we need. Once in our manufacturing facilities, every part is aggregated, sorted and triaged to ensure it meets the standards for our reconditioning process. We utilize strict engineering control plans and processes to test each and every part. Parts are then thoroughly cleaned, certified and re-tested to make sure they pass original form, fit, function and finish. Parts are readily available through our website, OriginalOneParts.com, and the leading collision repair software platforms. Parts are securely packed and shipped with a Limited Lifetime Warranty, offering same-day delivery where available, a 24-hour delivery option and a 2-day delivery guarantee. Although the parts we sell are CERTIFIED ORIGINAL™ parts, we are not the "original manufacturer" (or "OEM"). References to manufacturers vehicle or trademarked names in any of our web pages or printed material are for descriptive and identification purposes only. References to manufacturers trademarked names do not indicate that the manufacturer warrants, sponsors or has in any way approved the parts we sell. Original One Parts™ is not affiliated with vehicle manufacturers such as Ford Motor Company, General Motors, Daimler Chrysler Corporation, Jeep, BMW, Honda, Mercedes, Volkswagen, Toyota, Nissan, nor any other vehicle manufacturing company. No implication is made, and no inference should be drawn, that the parts we sell are warranted by the original equipment manufacturer. In general, Original One Parts™ sells refinished CERTIFIED ORIGINAL™ parts to Original One Parts™ specifications using our VINtegrity™ certification process.